A brochure came in my mail today, titled “The Roman Catholic New Testament ‘Title Page’. 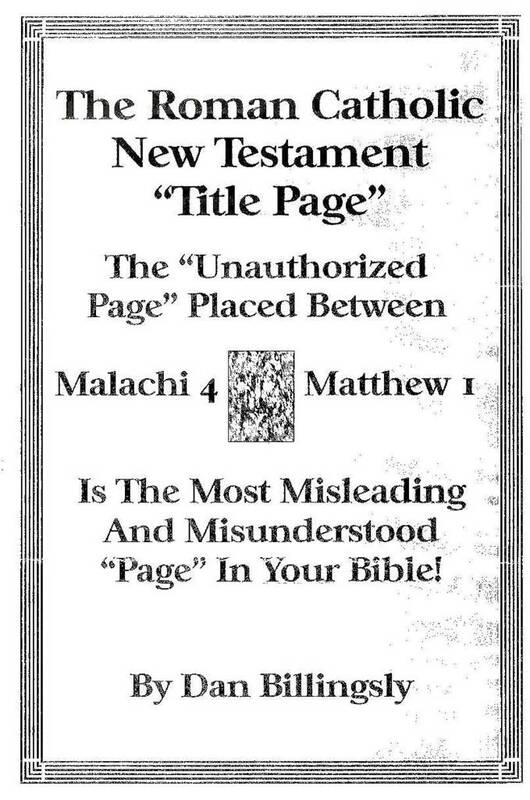 The ‘Unauthorized Page’ Placed Between Malachi 4 and Matthew Is The Most Misleading And Misunderstood ‘Page’ In YOUR Bible!”, by Dan Billingsly. I had a couple of immediate thoughts. First, the title needs work. Second, that’s quite a claim if it is true. Enlarge by clicking image. When new image appears, click again AND click square that appears. Brochure page: 2, 3, 4. I wondered what this was all about. At first, I thought it would be a typical lesson on distinguishing between Old and New Testament doctrine, something I believe is important (Heb. 9:15-17). But it turned out to be a sales pitch for a new New Testament with a radically new idea behind it. The four Gospels are included in the Old Testament, not the New Testament. I wondered what evidence the author would offer for this position and was there another motive at work. Though this was a completely new idea to me, I quickly concluded that it had to do with excluding a particular doctrine from the New Testament church. I guessed correctly that Billingsly intended to show why Jesus’ strict teaching on divorce and remarriage (Click on page four graphic to see real intent) was no longer was an issue. According to Billingsly, since the Old Testament is “done away”, and the Gospels are Old Testament, then Jesus’ teaching on divorce and remarriage is “done away” as well. By this, Billingsly contends that there is no “adulterous marriage” or “living in sin”. What is the truth? The New Testament “Title Page” found just before Matthew does not mark the beginning of the Church. The Gospels that tell of the life of Jesus Christ, begins to lay out the teaching of the New Testament church that would be ushered in after Jesus’ resurrection. The writer of the Book of Hebrews sheds some light on this subject. He indicates that the New Testament (covenant, law) went into effect when Jesus died (Heb. 9:15-17) and not at His birth. 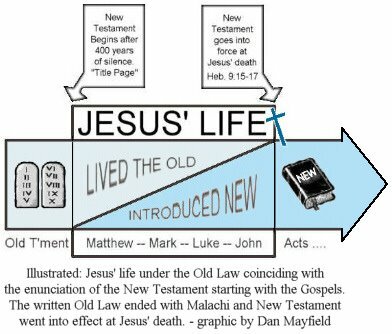 But the analogy of the New Testament being a will which goes into effect when the person dies reveals that Jesus’ commandments found in the Gospels were intended as part of the New Testament and not part of the Old that was “done away”. So if the question is: “When did the New Testament go into force?”, at Jesus’ death is the answer. If the question is: “When did the teaching of New Testament begin?”, in the Gospels is the answer. The Old Testament was in force after the “Title Page” at the beginning of the Gospels until all was fulfilled at the cross. Jesus therefore lived under and obeyed the Old Testament Law that remained until His death. However, what He introduced in His teaching was the New and better Law/Covenant/Testament. Here is a graphic I created to illustrate the transition. Billingsly’s tract is an advertisement for his 465 page New Testament that promises to “save you 25 years of Bible study” and will prove Christ’s Old Testament teaching on marriage, divorce and remarriage in Matthew 19 is not New Testament doctrine. Jesus’ restatement of the Old Testament Law of Moses, according to Billingsly, was only for the people of Israel and means that the doctrine of “adulterous marriages” and “living in adultery” are not taught in the New Testament. Interestingly, Billingsly teaches, according to http://www.religiousdebates.com, that you are condemned if you believe as he teaches that the Gospels contain New Testament teaching. He asserts that all of the wrangling over marriage, divorce and remarriage is the result of Catholic meddling. Because they placed that Title Page between Matthew and Malachi, Jesus’ moral teaching on divorce and remarriage has been wrongly applied as New Testament teaching in the Church. Billingsly seems prone to making sensational, but unsubstantiated, claims. He is wrong about the teaching of Jesus in the Gospels. There’s no doubt that Catholics have meddled with the truth, but the Title Page reflects the truth if we understand that the Church did not begin until Pentecost (Acts 2). Billingsly’s whole “CATHOLIC ‘TITLE PAGE'” and “MOST MISUNDERSTOOD PAGE” thing is a transparent and weak attempt to nullify what Jesus said about divorce and remarriage. The truth is, Jesus taught God’s will on marriage for all mankind. Unless your spouse was unfaithful, if you divorce and remarry, you are committing adultery and living in sin. Billingsly cannot get around this. His explanation fails to once and for all loose man from the consequences of sin. Are we misled to believe that Christ’s teaching in the Gospels of Matthew, Mark, Luke, and John are done away with because they were uttered before the crucifixion? No, we are not misled. The Testament which Christ highlighted during His ministry, the New Testament, went into force at his death. During his earthly ministry, He was speaking of the future kingdom and urging everyone to repent. Thus Jesus’ teaching on marriage is still in force. As from the beginning, the institution of marriage must follow the design of God. It’s too bad that false teachers don’t just come out and state their true agenda. These who twist and distort the New Testament cannot undo the fact that Jesus taught about the New Covenant which would not go into force until his death (Hebrews 9:15-17). Because Jesus already called for repentance prior to the advent of the Church does not negate this truth. Jesus taught about morality, including His law on marriage, during His public ministry. Those who despise the teaching He gave on marriage, divorce and remarriage have to suppress this truth in order to gain a following. Shame on them. Very nice graphic, good idea as well. Another complementary approach is that the Gospels, dealing as they do with life and ministry of Christ, were written after his death, by Christians, for Christians, in their varied situations to help them understand the meaning of Jesus’ teachings for their lives. As such, they are very much a part of the new covenant. Blessings! Dear Anonymous,Thanks for commenting. I imagine that Mr. Billingsly has a small following in your neck of the woods, but most people see through his scheme. My opinion is that it would be much more honest to just admit that this is an attempt to get around Jesus’ teaching on divorce and remarriage. Jesus came to fulfill the Law, true. But He also spelled out in His words and deeds the spirit and teaching of the New Testament. Do you remember that HE is the testator of the New Covenant which could only go into effect at His death (Heb. 9:15ff)? You are misguided to think that Jesus did not introduce His New Covenant WHILE living under the Old one. On moral issues, like adultery or murder (Mt. 5), God’s prohibition stands across Covenants. You quote from the sermon on the mount, but you don’t think it represents the teaching for the New Covenant. And the 1 Corinthians 7:27,28 reference says, “27 Are you bound to a wife? Do not seek to be released. Are you released from a wife? Do not seek a wife.28 But if you marry, you have not sinned; and if a virgin marries, she has not sinned. Yet such will have trouble in this life, and I am trying to spare you.” You presume that the bound person is the same as the released person, and that would be wrong. The context of this section is to stay in the state you were called in. If you are married and are a Christian, no problem, stay married. But when he says “are you released”, it presupposes it is under Scriptural grounds that do not violate what he said just verses earlier in 7:10,11 where Paul says “remain unmarried or be reconciled”. What Paul said in these verses do not permit your interpretation of verse 27 and 28: “If anyone marries, he has not sinned.” Let me say what should be obvious that this is true only IF you have been released. But if you have not been released, as verse 10 and 11 shows not everyone is, then you have sinned. The teaching in 1 Corinthians 7 is completely in line with what Jesus taught about divorce and remarriage in Matthew 5 and 19. I hope you will take a stronger stand to defend marriage and accept that many people are living in sin. They are not helped by false teachers who go around proclaiming that Jesus’ teaching was Old Testament. And your mistreatment of Romans 15:8 is stunning. That text says that Jesus ministered to the Jews – the circumcision – and to the Gentiles. You have missed the picture because of your distaste of Jesus’ teaching on divorce and remarriage. Since you teach that Matthew 19 and the message on divorce and remarriage is only Old Testament teaching, why would you think that Jesus’ moral teaching on marriage would be nullified today? Do you think His teaching on honoring your parents is nullified? Do you think his moral teaching against lusting after women is nullified? Very interesting. I dont mean to sound dumb but is this a “Church of Christ”, Catholic or all denomination type people making comments? Hi Troy, Glad you stopped by. Whatever you are, you just made a comment and feel free to make another. Over in the right column are some of my favorite links. Feel free to visit them if you have the time. God bless. It seems that Billingsly has figured out what you guys are incapable of understanding. Your darkness contradicts what you practice. Shame on those who criticize and attack men who study to find the truth, instead of blabbering the same old tired tradition. Jesus' harshest words were for those who followed tradition, instead of the will of God. Who is The One Incapable of Learning Mr Bobby? You Got all the Answers for us?????? There Righteousness Must Exceed The Scribes and Pharisees. Question Have any of You Heard of New Testament Scribes And Pharisees? Next Mathew 5:28 To Lust After another Woman Was In The Law Of Moses. Read Exodus 20:17 Thou Shalt not COVET Thy NEIGHBORS WIFE. Covetousness Unlawful Desire. Next Mathew 5:22-24 What New Testament Gift Do We Bring? And Where is our New Testament Altar??????????????????????? Next Mathew 5:38 The Old Eye for an Eye. This is ot New Testament go Read Exodus 21:24 Go read The Conditions for the ol Eye For an Eye No New Testament in Mathew 5:38 Next Mathew 8:4 Remember Jesus said All He Commanded so go do This Traditional Brethren. Mathew-John New Testament I Don't Think so. I sincerely mean this. You are blinded by Billingsly. We didn't say everything in Matthew through Mark is New Testament. Jesus lived under the Old Law – in effect until the Cross (Heb. 9:15-17). But while He lived under the Old Law, He introduced the New Covenant. That's not hard to understand at all unless you are blinded by your desire to keep people in adulterous marriages. Billingsly is a false teacher of the highest order and you are his disciple. I'm sorry for you. Here are some of my notes on this topic. Some insist that “Matthew, Mark, Luke, and John before the cross” (a.k.a. MMLJBC) is not binding since those events occurred in Old Testament times. This is mostly a movement to get away from Christ’s teachings on divorce and remarriage. Therefore, they see only the things taught after the resurrection as binding. They say all of what Jesus teaches is not new, but only a commentary on Mosaic Law. Would one want to say that Jesus nailed all of His own teachings to the cross? Were His teachings only for the three years of His ministry and then they vanished? Not one parable is binding? Sermon on the mount is not for Christians? It appears Jesus commanded His disciples to teach what He said. Mt 28:20 – teaching them to observe all that I commanded you; and lo, I am with you always, even to the end of the age. The truth is that Jesus came ushering in and proclaiming the new covenant and was therefore commenting on the old but also introducing the new, thus fulfilling the old by fulfilling the prophecy to bring something new. Lk 16:16 – The Law and the Prophets were proclaimed until John; since then the gospel of the kingdom of God is preached, and everyone is forcing his way into it. He didn’t just teach the Law of Moses correctly, He improved it constantly. Mt 5:33-37 – “Again, you have heard that the ancients were told, ‘You shall not make false vows, but shall fulfill your vows to the Lord.’ “But I say to you, make no oath at all, either by heaven, for it is the throne of God, or by the earth, for it is the footstool of His feet, or by Jerusalem, for it is the city of the great King. “Nor shall you make an oath by your head, for you cannot make one hair white or black. “But let your statement be, ‘Yes, yes‘ or ‘No, no‘; and anything beyond these is of evil. There are many teachings that have nothing to do with the old. Jn 3:3-5 – Jesus answered and said to him, “Truly, truly, I say to you, unless one is born again, he cannot see the kingdom of God.” 4Nicodemus said to Him, “How can a man be born when he is old? He cannot enter a second time into his mother’s womb and be born, can he?” 5Jesus answered, “Truly, truly, I say to you, unless one is born of water and the Spirit, he cannot enter into the kingdom of God. To not acknowledge a transitory system is to condemn any soul who died between the Friday of Passover and the day of Pentecost to Hell. Perhaps, instead of focusing at where in the gospels these events took place, one should concentrate also on when the gospels were written. If it’s true that Christ’s teachings are not binding, then they weren’t finally recorded until an era in which they were not operative. Therefore, they became Scriptural teachings that were never binding as Scripture to anybody. The truth is that the gospels were written during the time of the new covenant for new covenant people. It is also indisputable historical fact that early Christians obeyed the teachings of Christ. Should we then have it that Christians can call Christ Lord and Master, but then do not obey any of His teachings? Thanks Randy. Great points. Very helpful to anyone really seeking. Billingsly has an agenda which makes him ignore the obvious. I hope others will read your comment. What Kind of Reply was This? Luke 16:16-17 Sais The Law is Still In Force.What is It With The Divorce Remarriage You People Always Bring up. Is That Some Kind Of Litmus Test to Prove Your Point? If So You Failed Miserably. !Were The Teachings Of Jesus in Mathew-John B4 The Cross His? Not According to Jesus John 7:16, so Yes Jesus Nailed God The Fathers Old Law Of Moses He Taught To The Cross.Mathew 5:33-37 Was Part Of The Law Of Moses, Jesus in The Previous Verses Made That Quite Clear Mathew5:17-18 Mathew 28:20 Was After The Cross, Not B4 so Jesus Was Telling Those Jews to Observe All He Taught After The Cross. ACTS 1:1-3 All New Testament Truth.John 3:3-6 was Not A Command, but A Prophesy of What A Jew Had To Do After The Cross. How Do You get New Testament Out of Prophesy? I get So Tired of When These Books were Written Non Sense. If They are Talking About The Law Of Moses, it Would Make No Difference If They were Written Today, because They Still Are Dealing With Jews Under That Old Covenant. Mr. Martin Your Replies were Terrible on Proving Your Point. I Am seeking Truth, and I Know That Mathew-John B4 The Cross is Old Testament. Legend is trying to turn the tables when it is they who invented this issue with the New Testament Title Page in order to get around Jesus' teaching on Mt. 19, etc. So Legend, the litmus test is if you distort the Scriptures. If you distort the Scriptures, that's the litmus test. Look at what Legend says and it's all a person needs to know about the Billingsly disciples. He said, “How Do You get New Testament Out of Prophesy?” Joel 2:32 is prophecy about how to be saved in the New Testament. He says John 3:3-6 isn't a command, it's prophesy for Jews after the cross. How does Legend and Billingsly distinguish these things? It's not a “prophesy” for the Gentiles? And why can't they agree, to use their terms, that the other teachings of Christ – like Mt 18:15ff and church disciples – are “prophesy” for the New Testament church? Hmmm. Well Mr.Dan Mayfield is At It again With Hiis Traditional Blunders And Deception. He Thinks Mathew 18:15 Is The New Testament Church HA HA. Watch What Happens When We Do What God Tells Us To Instead Of Un Inspired Men. Acts 7:37-38 King James Version It Was Gods OLD TESTAMENT CHURCH In The WILDERNESS. Once Again Another Traditional Blunder.He Thinks Joel 2:32 Is Revealed New Testament Doctrine On How To Be Saved. HA HA Not According To Paul An Inspired Man Ephesians 3:3-5 No Revealed New Testament Until New Testament Age Begun, Once Again Another Traditional Blunder. These Traditionalites Are So Deceived By There Father satan, Because He Is The Daddy Of All Lies.John 8:44 Since JEW Think that Passage Is New Testament Although Jesus Was Not Talking To You, But A Jew Still You Insist It Is New Testament Join Your Father.Hummm.I Dare You To Post This Mr. Traditionalite.Yes John 3:3-6 is A Short Range Prophesy, Since No Jew Was Born Again Under The Law. Wake Up. I can see that you have your own distorted way of viewing the scriptures. Reason doesnt work with you. I have a question for you. Why do you come here and read these articles? I happen to come and read for a strengthening on my faith. I see in the Bible the truth found in this article. I see it because my eyes are open. You will never see or understand because it is not your will to do the will of our Father in heaven. You twist and distort the word to fit your life and then you insist on persecuting men like Dan Mayfield who preach the TRUTH. If you believe him to be teaching error, I am truly sorry for your soul. I know though that there are other people who will tell you exactly what you want to hear. These things will please your itching ears. I pray your heart is one day open to the Truth before it is eternally too late. When Gospel Advocate had an online discussion board, at least a decade ago, Dan Billingsly came into one of the discussions posting his message about the “Roman Catholic Title Page” that was introduced only about 500 years ago, etc. I pointed out to him that, before there was such a thing as the Roman Catholic Church, early Christians were making copies by hand of “Old Testament books” and “New Testament books.” These early Christians distinguished between the two in the second century, and they grouped the four gospels with the New Testament. This was true even in the Eastern Church, which generally copied only Greek manuscripts, even of the Old Testament (i.e. the Septuagint). Yet, with the same Greek scribes copying in the same language, they separated O.T. from N.T. and put the gospels in the N.T. Other posters concurred and cited various examples. Dan Billingsly had no response to these facts. Instead, he wandered over to other discussion threads and posted the same message, that it all started in 1486 A.D. or whenever he claims, with the Roman Catholic Church introducing a title page before Matthew, etc., and links to his web site with the same claims. I am reluctant to throw around the label of “false teacher” for anyone who teaches something I disagree with. I reserve it for those whose teachings are refuted, yet they go on teaching them. Unfortunately, Dan Billingsly fits that description. If anyone wants me to take the time to post extensive quotes from the first few centuries concerning what pre-Roman-Catholic-Church Christians considered to be the Old Testament and the New Testament, I will do so. Please post the information you have. It would be much appreciated. From volume 2 of Brother Everett Ferguson's “Early Christians Speak,” chapters 2-3 contain early statements about the Old Testament Canon and the New Testament Canon. Many pages could be posted. I will start with a quote that addresses both the OT and NT, from the Easter Letter of Athanasius in 367 A.D. Note that the Hebrews combined the 12 minor prophets into one book, combined 1&2 Samuel and 1&2 Kings and 1&2 Chronicles, etc., so that they only had 22 books rather than 39 in the OT. “These are, then, of the Old Testament, twenty-two books in number; … The first is Genesis, then Exodus, next Leviticus, after that Numbers, then Deuteronomy. Following these there is Joshua, the son [of] Nun, then Judges, then Ruth. Then, after these, four books of Kings, the first and second being reckoned as one book, and so likewise the third and fourth as one book. And again, the first and second of the Chronicles are reckoned as one book. Again, Ezra, the first and second are similarly one book. After these there is the book of Psalms, then the Proverbs, next Ecclesiastes, and the Song of Songs. Job follows, then the Prophets, the Twelve being reckoned as one book. Then Isaiah, one book, then Jeremiah with Baruch, Lamentations, and the Epistle [of Jeremiah], one book; afterwards Ezekiel and Daniel, each one book. Thus far constitutes the Old Testament. Numerous other quotes can be found in this source that show that early Christians divided the OT from NT with the gospels in the NT, without even waiting for a “Roman Catholic title page” a thousand years later. None of the OT canon lists of early Christians have the gospels listed. Readers can also search “Athanasius Easter Letter canon” and they should be able to find an online translation similar to what I posted from Brother Ferguson's book. In the online discussion with Dan Billingsly a decade ago, which I references in my first posting, it was pointed out that early Greek manuscripts of the New Testament start at Matthew, and the Greek churches often copied the OT Septuagint and the NT as separate manuscripts, although they also made complete Bibles. They never grouped the gospels with the OT. It was pointed out that this evidence predates Dan B. 's “Roman Catholic title page” by a thousand years. He had no response, and kept on posting his canned script wherever he could. Very nice post. Thank you for the effort as it is much appreciated. I hope that Mr Billingsly will repent of his error. But like many, he can't let the facts get in the way of his true desires. I'm confused. How is what Jesus saying in the Sermon (Mt 5-7) NOT new teaching? “You have heard it said…but I l say to you….” How is that one teaching? Why Do So Many Brethren In Vain Use Uninspired Men In Vain To Prove The Old Testament Books Of Mathew-John Describing Jesus Before The Cross Are New Testament Doctrine? I Could Care Less If You Stack 1 Million Of These Men Together Proves Nothing. God Plainly Teaches These Books Belong In The Old Testament. I Think I Will Stand With God On This Issue, You Can Have Your Vain Uninspired False Teachers All You Want.I Take Jesus At His Old Covenant Word. Mathew 5:17-18 Mathew 7:12 I Believe Paul An Inspired Man Of God. Romans 15:8 King James Version. I Believe Paul In Galatians 4:4-5 And Mathew 1:21. I Believe Jesus Did Not Do His New Testament Will Or Teach His New Testament Doctrine Either. John 6:38 John 7:16. So You Keep On Believing In Vain All These False Teachers I Will Stick To The Words Of Jesus And Paul.Any Way You Stack It The New Testament Begins In Acts 2 And That Is A Covenant Fact All The False Teachers Of This world Can Never Change Amen. So if Jesus was only referring to Jews and OT law in Mt. 19, do all of Jesus' statements and teachings pertain only to Jews? If not, which of his teachings pertain to Christians today, and how do we decipher that? The pamphlet implies that only teachings which are reiterated and/or reinforced following the Gospels are relevant today. If this is the case, why would Jesus even come to Earth, if only to state that which was already stated? Jesus came to fulfill the law (i.e., expose the fundamentals via greater insight into the nature and will of God), not to restate it. The danger here isn't limited to marriage and divorce – this is just a convenient example fitting the author's contrived narrative. As I see it, the deeper fallacy is that the entire purpose of Jesus coming to Earth is entirely gutted by claiming that his teachings aren't unique. If they aren't unique, then they aren't important. If Jesus' teachings pertain only to Jews, then he only saves Jews – so who saves me? Paul? There's more remaining to be addressed by the pamphlet then a brief history lesson focusing on a title page, of all things. You Ask Why Is Mathew-John Only The Law Of Moses. Here Is Why. First Jesus Was The Only One Who Could Keep The Law Of Moses Perfectly. Second Only Jews Had Salvation Under The Law Of Moses. Amos 3:2 John 4:22 Ephesians 2:11-12.Why Is It So Difficult To Understand These Clear Facts? Read Mathew 19:16-21 Is That Not Clear Enough On How Jews Were To Have Eternal Life Under The Law Of Moses? Do We Not Read In Galatians 4:4-5 Jesus Was Born Under The Law To (Redeem) (Save) Those Jews Still Under The Law Mathew 1:21 Jesus Will Save His People From There Sins. Who Were Gods People In Mathew-John Describing Jesus Before The Cross? Do We Not Read In Romans 15:8 King James Version Jesus Was (Past Tense) A Minister Of The Circumcision. No Mention Of Him Being A New Testament Evangelist At All.Did Not Jesus Tell You Clearly His Teachings Or Doctrine Were Not His In John 7:16 Did He Not Tell You He Was Not Doing His New Testament Will Before The Cross John 6:38 How Much Plainer Could It Possibly Be? I Want You To Tell Me How In The Name Of Comon Sense Can Jesus Not Do His Will Or Teach His Doctrine, And It Be His New Testament Doctrine? What Is It With Mathew 19:9 You Folks Always Run To? If Mathew 19:16-21 Was Old Testament You can sure Bet Mathew 19:9 Was To. Read Deuteronomy 24:1-4. Why Not Go To The New Testament Book Of 1 Corinthians Chapter 7 See What Jesus Sais In The New Testament about That Subject? Especially Verses 15.27-28 No Mention Of Comitting Any Adultery Here. How Bout Romans 3:19-21 Romans 10:1-6 Can't get It Much Plainer Than This Folks.What Happens If We Preach Any Other Gospel Than The Apostles? Acts 2-Revelation 22 Acts 2:42 2 John 9-11 Galatians 1:6-9 You Can sure Bet Mathew-John Describing Jesus Before The Cross Was Another Gospel. It Was Only For The Jews Under The Old Testament Kingdom Of God The Father. Mathew 4:23 Mathew 21:43 Mathew 10:5-6 Mathew 15:24 Read John 1:29 You Will Not Find One Passage Where Jesus Ever Took Any Gentile Sins Away Before The Cross, Not One.John 4:22 Ephesians 2:11-12. John 1:17 Jesus Never Once Used The Word Grace Before The Cross. Grace And New Covenant Truth Were After The Cross. Mathew 28:18-20 Acts 1:1-3. Folks It Just Can't Be Any Plainer Than This. Anonymous at 10:30 PM misses the point. Dan Billingsly makes two kinds of statements. First, he makes many statements of Biblical interpretation. Second, he makes historical statements, such as a Roman Catholic “title page” in 1486 A.D. misleading all Christians into grouping the gospels with the New Testament. My quotations from historical sources disprove his historical statement. His statements of Biblical interpretation have to be dealt with in a different manner. If someone claimed that the Americas were uninhabited when Columbus arrived, then I would cite historical sources, archaeological evidence, and so on to refute that claim. The sources I would cite (e.g. the writings of Columbus and other explorers) would not be inerrant and infallible, nor divinely inspired, but they would still refute the claim. The one making the claim would then need to argue based on other historical sources, if desired. Neither of us would claim that our historical documents are divinely inspired. If Dan Billingsly wants to drop his historical claim about the Roman Catholic title page, let him do so. Then we can discuss other matters. But the bogus claim has an important psychological effect that Dan is unlikely to want to abandon. When you try to convince people they have been wrong about something important for their whole lives, it helps if they can blame it all on some villain who misled them. The Roman Catholic church serves this role for Dan, so he makes an historical claim that is simply ridiculous to any person who examines the historical evidence. This page is from Terry Benton, who has publicly debated Dan Billingsly, so I have to think that Dan B. has seen the page. Dan's loyal followers might want to contemplate what it means when someone makes a claim that is disproven multiple times in multiple places, and he does not retract the claim.